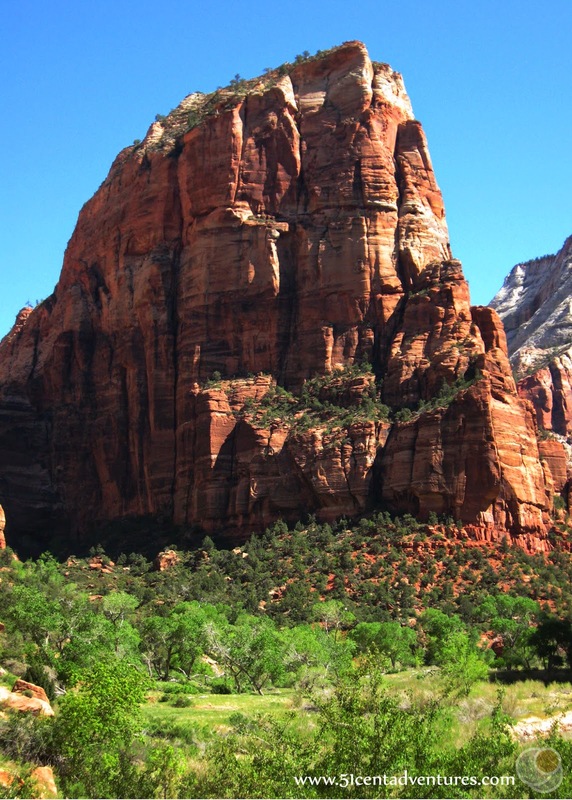 This post is a bonus feature to my earlier post about Zion National Park. When I wrote about my visit to the national park I wanted to include some pictures from my hike up to the summit of Angel's Landing. Soon I realized that I had so many pictures from that hike that I might as well give the hike its own post. 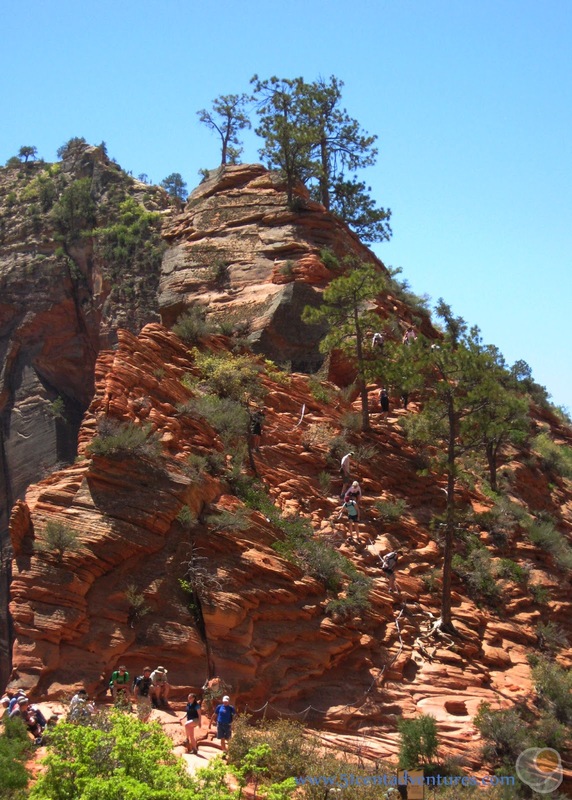 One of the most adventurous hikes in Utah, Angels Landing is not for the faint of heart. The trail takes you from long switch backs in the hot sun, to a canyon with cool breezes. From there you navigate 21 tight switchbacks known as Walter's Wiggles. This brings you to Scouts Lookout. From there you have the choice appreciate the view and then turn around, or you can continue up to the Angel's Landing Summit. The trail becomes increasingly difficult, requiring you to hold onto chains during some parts. The view and the sense of accomplishment that you receive at the top are worth it. Location: Halfway up Zion Canyon in Zion National Park. Take the park shuttle from the Visitor's Center to the Grotto shuttle stop. 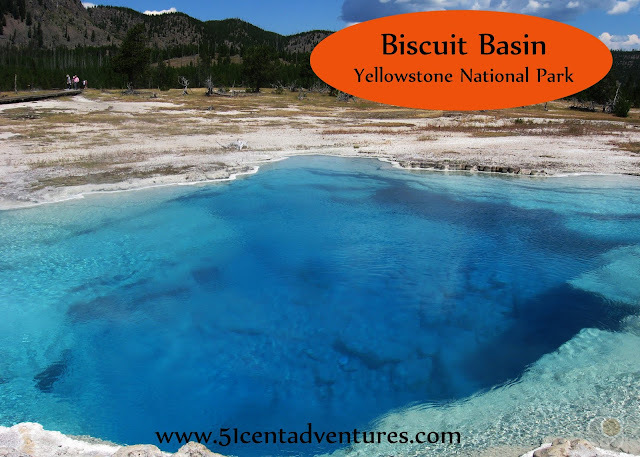 Cost: Admission into the National Park is $25 per car. 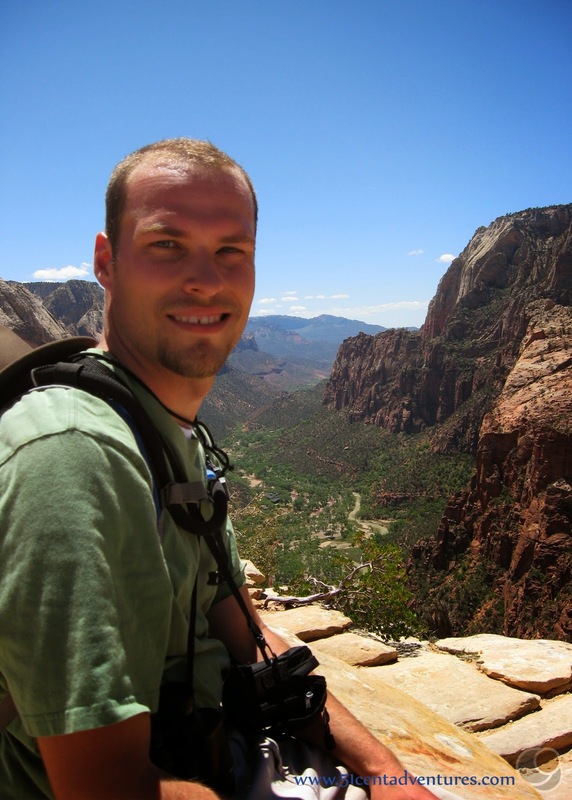 There is no additional fee to hike up Angel's Landing. Operating Seasons and Hours: Because of the steep drop offs along the trail, this hike should only be attempted during daylight and when the trail is dry. Check current trail conditions at the Visitor's Center. Recommendation: This hike should be on every hiker's bucket list. 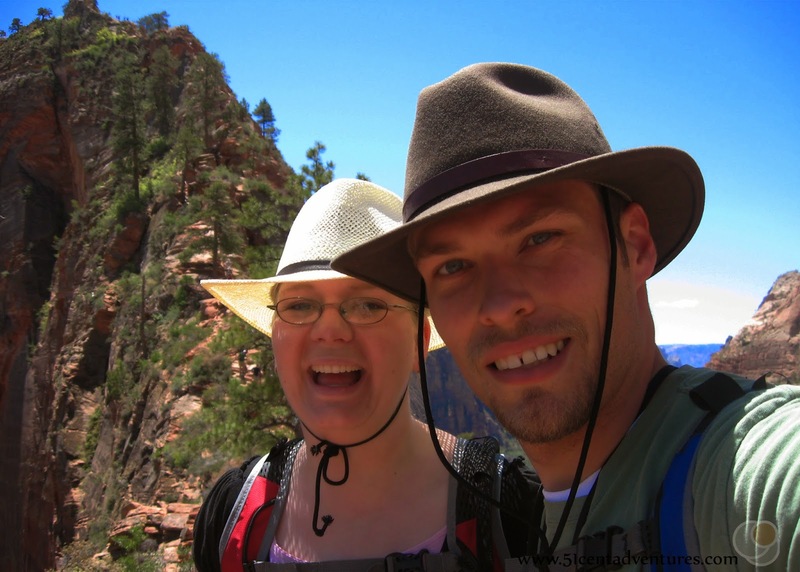 Hiking to the top of Angel's Landing was always on the list of things to do on the Southern Utah Road Trip that my husband and I went on in 2010. Both of us looked forward to challenging ourselves on the strenuous and dangerous trail. After we'd completed the hike Brandon and I made up a morbid game called, "Will They Survive?" As we hiked down the lower portions of the trail we'd pass hikers in flip flops and carrying a small water bottle (if that). We would try to guess when those hikers would realize they were unprepared and turn around. 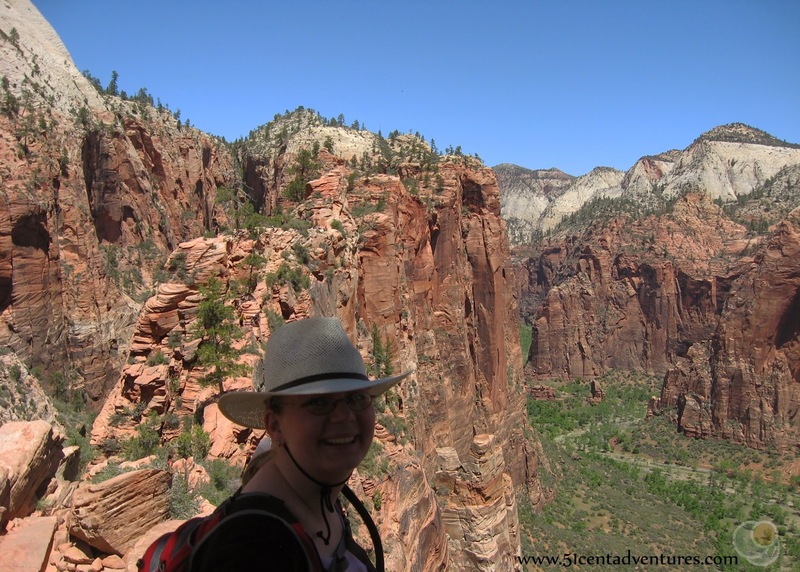 This post is to help you know what to expect so you don't try to climb up Angel's Landing unprepared. Before you attempt the hike you should be in good shape and comfortable with heights. The trail is steep and there are many drop offs. You should also bring plenty of water. We used up all the water in our backpacks as well as several additional water bottles. Wear shoes with good support. Don't forget to put on sunscreen. Brandon and I had been preparing for this hike for a while. We both were in good shape. I walked two miles to and from work each day. We also went on little hikes on weekends. The four hour hike up Angel's Landing would be the longest hike that we had ever done together, but we knew we could make it. What we hadn't planned for was that I would be pregnant. We found out I was 10 weeks pregnant - with twins - literally the day before we went on vacation. I knew I was still physically able to do the hike, but I also made sure I rested a lot as I went. Brandon and I joked that I was "hiking for three." 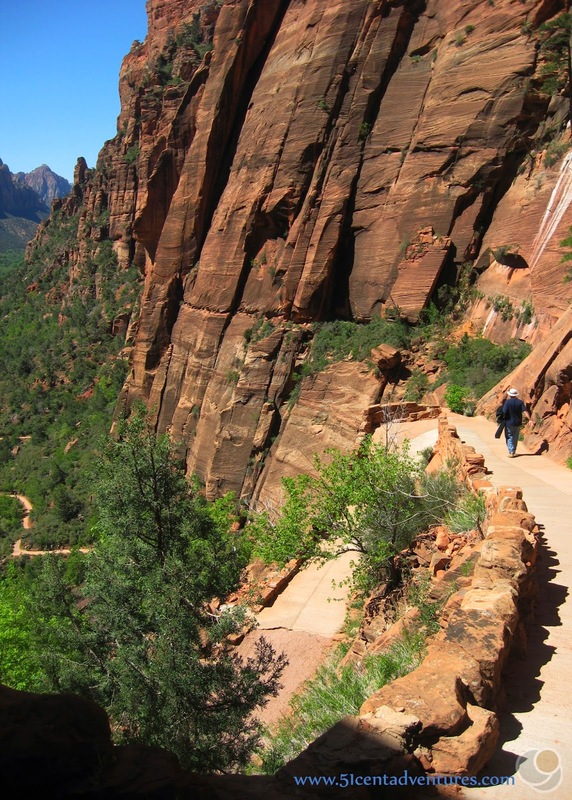 Angel's Landing is one of the most famous features and hikes in Zion National Park. It stands 1488 feet high. The round trip hike is 5.8 miles and will take at least 4 hours. To reach the trail head for the hike you take the park shuttle from the Visitor's Center up to the Grotto Shuttle stop. After you get off the shuttle you follow the signs to a bridge that crosses the Virgin River. The hike starts out with a long winding trail that leads to long switch backs. There isn't any shade during this part of the trail. Ideally we would have started hiking in the early morning. But we wanted to sleep in. It was about 10:00 before we were on the trail. The hot sun shone on us throughout this portion of our hike. The switchbacks become tighter and take you higher up the mountain. The side of the mountain gives an occasional bit of shade. 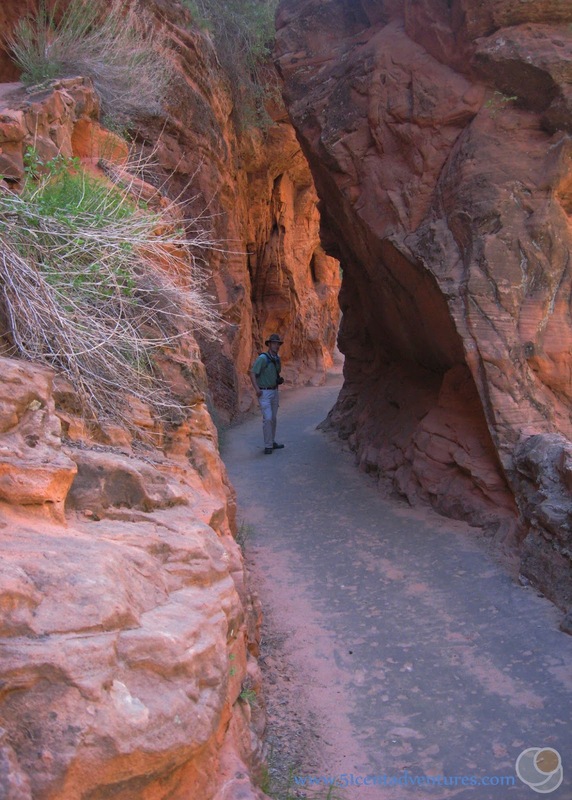 Eventually the trail reaches a slot canyon in the mountain. This is known as Refrigerator Canyon because of the shade and refreshing cool breezes that always blow through the canyon. 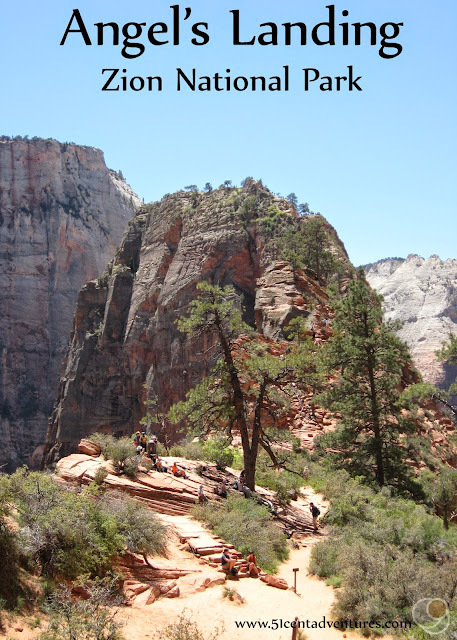 The trail through the canyon takes you to the backside of Angel's Landing. Refrigerator Canyon ends at a section of the trail known as Walter's Wiggles. These 21 tight and steep switchbacks were engineered in 1926 by the park's first superintendent, Walter Ruesh. They were resurfaced in 1985. The Wiggles were the section of the trail where I had to rest the most. I'd have to stop just about every other bend in the trail. I got used to being passed up by other hikers. Once you finish going up all the wiggles you come to the Scout Lookout area. The view looks out over the Big Bend shuttle stop area of the canyon. If you need them, there are two vault toilets up there. Many people turn around after Scout Lookout. But the very agile and brave continue along the ridgeline to the Angel's Landing summit. The trail is much more steep and narrow from this point. In fact, there are chains anchored into the rock to help you on your way. At one point you think you have reached the top, only to see more ridge-line stretching out ahead of you. When you finally reach the top, a beautiful view of the canyon is your reward. 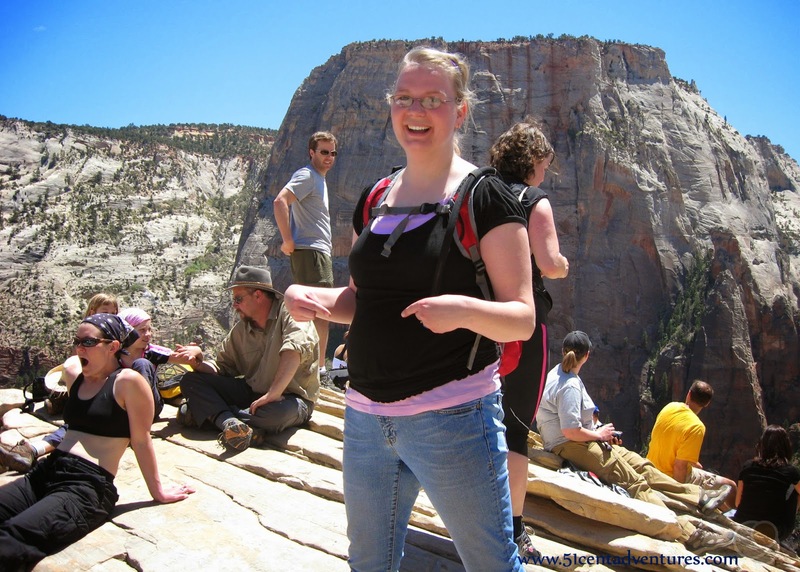 Here is photographic proof that I made it to the top of Angel's Landing while pregnant with twins. I wish I had thought to pose in a place where there weren't so many people behind me. I also wish that the mountain from the other side of the canyon wasn't in the shot, because it looks like I still have something taller that I needed to climb. But all I was thinking about at this moment was that I wanted to get my picture taken and then find somewhere to sit down. The top made me uncomfortable. I felt like a wind could blow me off the mountain at any minute. Brandon and I stayed up there for a little while and ate some snacks, but we both were happy to start back down the trail. I was surprised that the way down was actually harder than the way up. On the way up I was facing the mountain so I could focus on where to put my feet. On the way down I was facing the wide open vista. It was pretty freaky to see just how high up we were. Most of the hike back down the trail was uneventful. Aside from passing many hikers who appeared completely unprepared for the hike, I don't remember much about it. I think it took us about five hours to do the whole hike. I was very proud of myself for completing the hike - while pregnant with twins. My husband and I said that one day we would have to bring our kids back here and hike to the top of Angel's Landing with them. But. we added, they would have to walk up on their own next time. 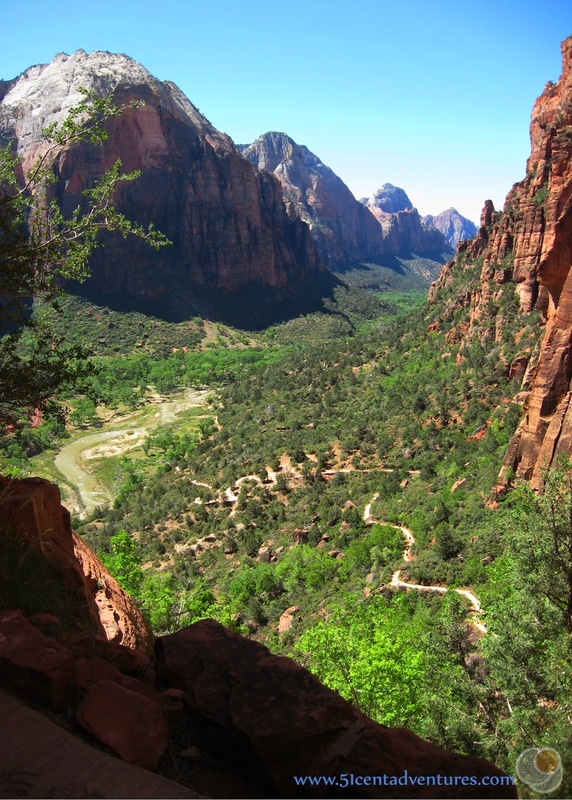 Additional Information: If you would like to see more of the Angel's Landing trail you can check out an e-hike at http://www.nps.gov/featurecontent/zion/eHike.htm. 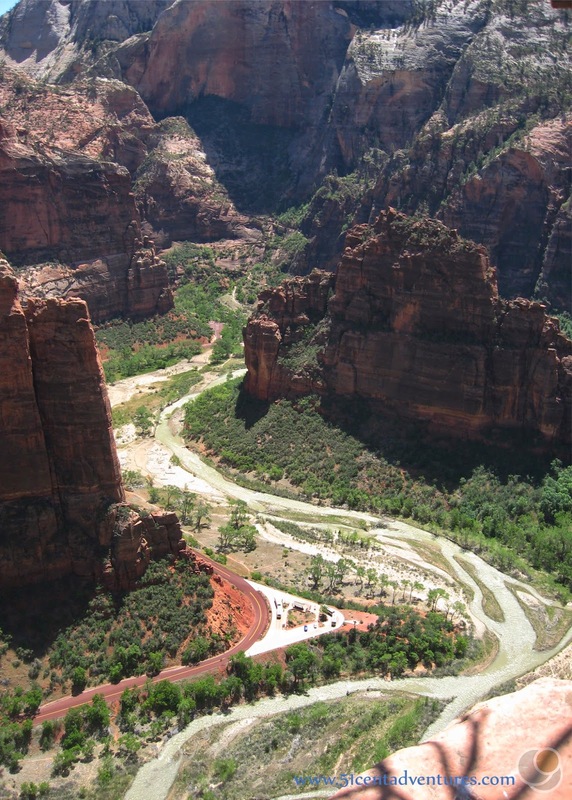 Places nearby: Angel's Landing is probably the most well known hike in Zion National Park, but it certainly isn't the only one. 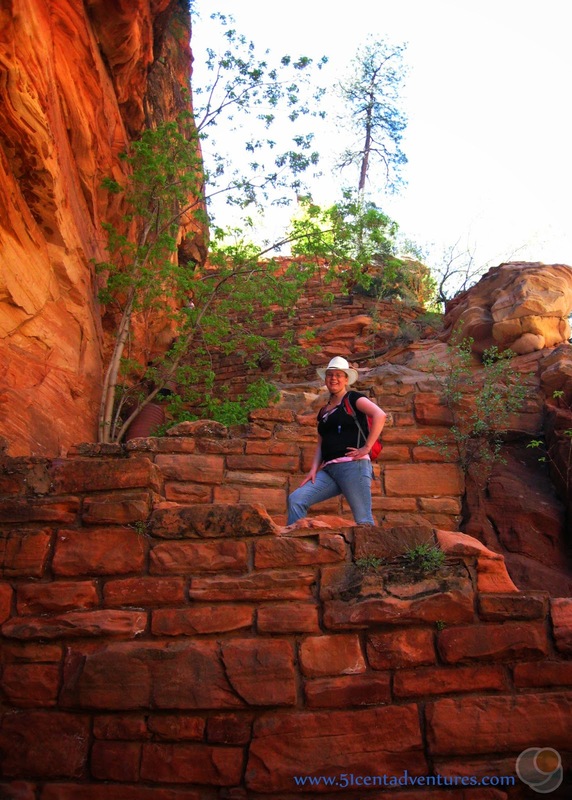 Check out the park's hiking guide for information about other trails.